I found two Otterware Defiler in a drawer. I think I originally wanted to turn them into Nurgle conversions but now that the Nurgle army tray is completed (and full), I did them up as extra Iron Warrior Defilers. Now that the Epic Chaos armies are completed, I am going to build display bases for them. I am using the same general approach as for the Flames of War base document here. I am using the same black frame (I have 50 of them, custom made to fit into the display cabinet – many more bases to come!). It’s taped off in the picture to protect the gloss finish until everything is done. So far I have created the back walls out of MDF and filled in the elevation levels with dense foam. The MDF walls give a clean finish and protect the edge of the foam in the elevated rear section. 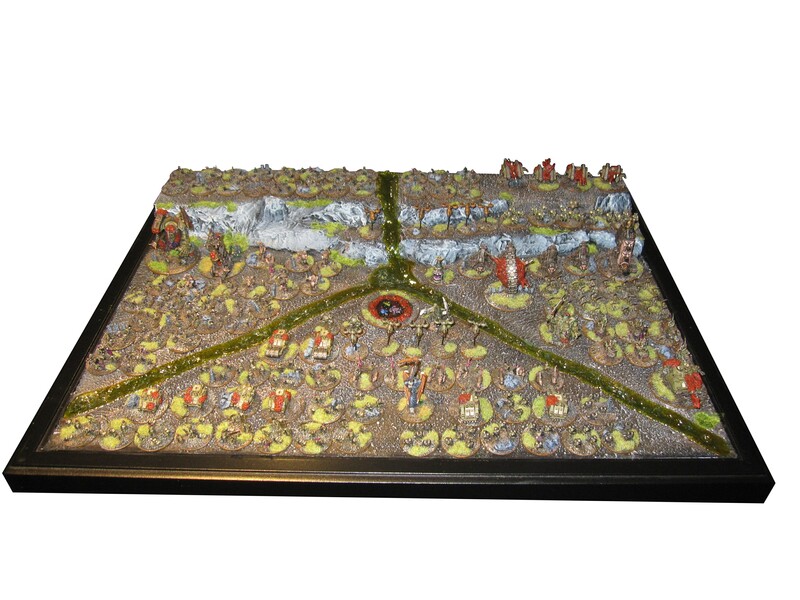 The pic below shows the status so far with the Nurgle army set up. That step is essential as most of my armies are large enough that they just barely fit onto a full base (some need two bases). Click on the pic for a larger version. The base will have a tiered rocky hill at the back and a river running down the hill (probably a waterfall), with extensions going into a triangle shape towards the front corners. It will be a slime river of course… The shape is a play on the Nurgle symbol. I don’t have enough space make three large lakes in a triangle (the actual three-dot Nurgle symbol). So the rivers effectively subdivide the army into three blocks in the right configuration. Next step is to cover the surface in magnetic sheet (to hold the models in place – everything has a metal base). Afterwards I will add moulded rocks to the cliffs and start the spackle work for all the cracks. The very last model of this ToEG project is completed. A mighty Tzeentch Banelord Titan. The project lasted exactly one year (well, 48 hours are left) and led to about 27500 points of painted Epic Chaos goodness. That’s 653 models ranging from lowly Chaos Hounds up to mighty Titans. Khorne, Nurgle, Tzeentch, Slaneesh and the Undivided Lords of Iron all had their share of the bounty. It has been a joy to work on this project. I shall build a few display bases and add final army shots when those are done. The last few ToEG items for the Lost and the Damned are sluggishly clearing my paint station. Below is a Lord of Change based on the Warmaster model. The colour scheme is a bit muted to fit in with the rest of the Tzeentch contingent. I got the model in a trade from TacComs (including wings). Paintjob is mine. Old model, new paintjob inspired by old colour scheme. May was a pretty odd month, with very little painting work done. I finished the remaining Chaos models for a total of 2085 points (5 models 🙂 ). Below is the Nurgle Banelord Titan. The model was converted by somebody on the TacComs forum and then painted by me. The colour scheme ties in with the green/red/purple/bone scheme of the Nurgle contingent. Other photos will go up shortly. My WIP versions of the Firelords and Hellhounds promoted some comments, so here are the final versions. As suggested, I went with red for the Firelord “power cells” (or whatever the things on the wings are). The Hellhound fuel tanks were repositioned as well. My first challenge for the TacComs “Tale of Epic Gamers” event is coming to an end. It motivated me to paint some a Chaos force coming in at just under 29,000 points and covering five gods as well as all variant lists. That’s 681 models/bases. I am now starting at the last 4 models and most are in semi-completed state. I hope to have everything wrapped up this month. All four options are assembled and based. The last option are Necrons which are still in progress of being sourced. Probably not the best choice until I have all the models together. Last time I made the decision by vote, so here we go again.